An exciting new development for cycling is about to start construction along the Christchurch Northern Motorway corridor. 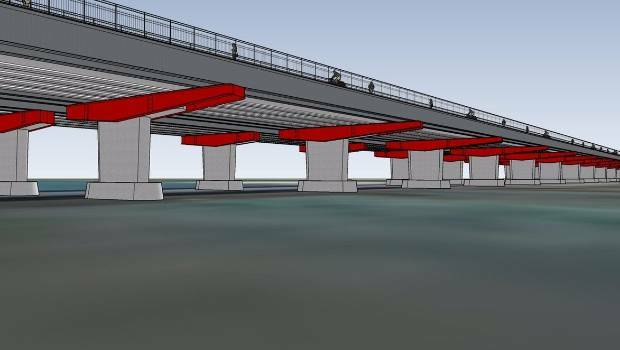 From the end of August, work will begin to construct additional lanes on the Waimakariri River motorway bridge. 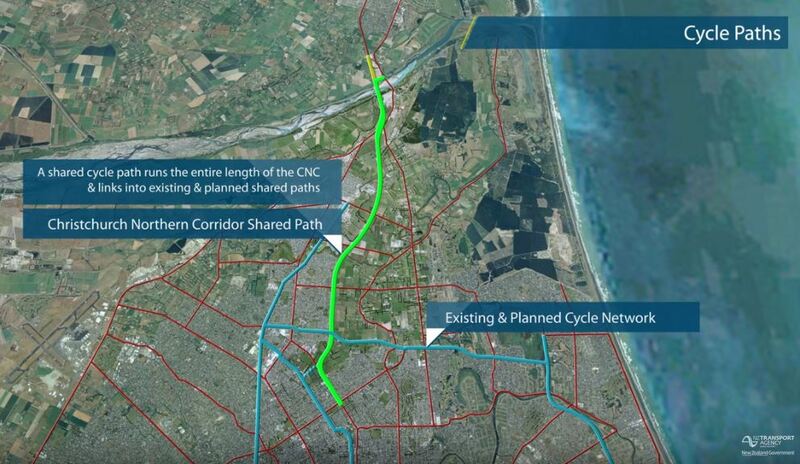 As well as two extra traffic lanes, designed to accommodate high-occupancy vehicles (including buses), a clip-on cycleway will also make it much easier to cycle between Christchurch and districts to the north. A snazzy video shows all the details of the bridge works and the rest of the northern corridor project. At present, your options for biking to/from the north are to chance your arm on the narrow Old Main North Rd bridge, or to put your bike on a bus crossing the Waimak. The new clip-on, outside the southbound lanes, will provide a protected facility from traffic. The other nice development is the work to continue the cycleway along the northern motorway corridor. 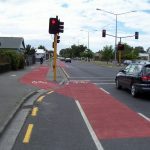 Initially, when the northern motorway route was proposed, NZTA had the parallel cycleway stopping at Belfast Rd, with no clear indication of what happened north of that. Fast forward a few years and now cycling is being taken a lot more seriously (and funded accordingly too). It’s great to see another piece of the cycling puzzle coming to fruition. 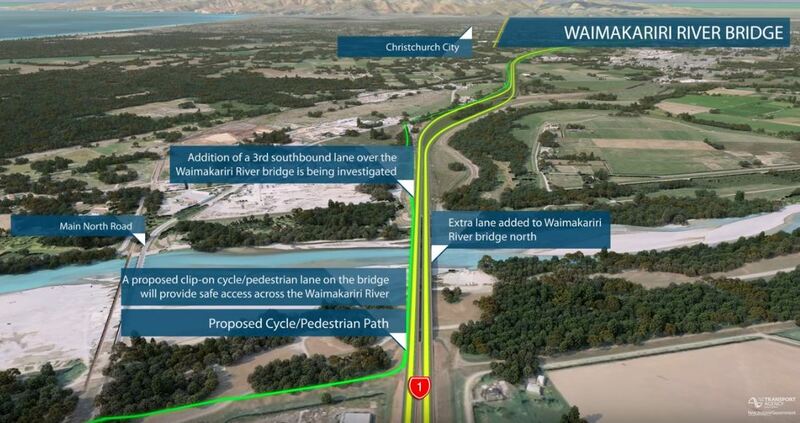 For commuters from Waimakariri District and cycle tourists to the north (likely to increase with the development of a cycle trail to Marlborough), this will greatly help safe cycling to Christchurch. The bridge works should be completed by the end of 2019. Would you use the new northern cycleway? Nothing provides motivation for a PR across the horrible narrow old bridge like a car up in your back wheel! I won’t miss that AT ALL. This promises to be an improvement. At the moment Marshlands Rd is fine for the most part, excepting for: the abominably rough chip used approximately 2km either side of Styx River bridge (no need to go to northern France for a cobble-like riding experience – how I wish they would have left the admirably smooth shoulder intact when they resurfaced this section); Styx bridge is narrow with next to no shoulder and although its fine for the most part riding over it at the same time as a car, trucks are a scarier proposition, and; the railway crossing is even narrower, sometimes nerve-wracking on the occasions when a motorist thinks passing a cyclist at 80km/h but with nary half a metre clearance (or even less on one occasion with a boat trailer) is fine. Even though a very confident cyclist capable of doing a fair clip – especially on the current Waimakariri bridge! – having a proper, truly cycle friendly crossing, will be a boon. It is way, way, way overdue. Chipseal is cheap to lay large sections and more durable than asphalt for vehicles. The only advantages of smooth asphalt is that it can be laid in smaller amounts easier than chipseal, which requires a lot of timed laying and rolling and machinery. Lets hope we never see a chipseal pathway! Another nice feature of chipseal surfaces when cycling is that rainwater generally drains off it below the top of the stones, thus minimising the spray that you can encounter on an asphalt surface on a wet day (although there are open-graded porous asphalts that can be equally good, e.g. ‘Whispa’).